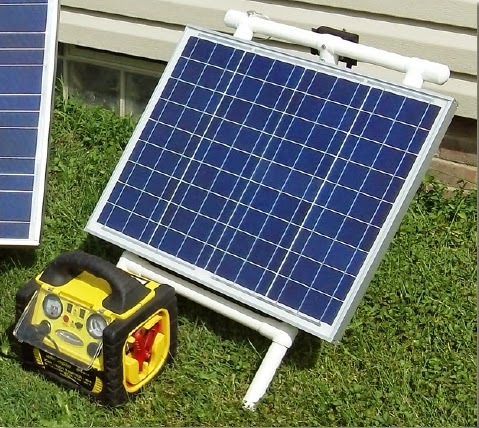 John provides a very detailed description of a small and portable solar generation system that can provide power for emergencies or camping or routine use. The system consists of a 45 watt PV panel, a charge controller to regulate battery charging, an off the shelf power pack that contains both the battery and inverter, and a PVC pipe rack you make to support the panel. The system will provide power for things like a laptop, some modest lighting, charging cell phone batteries, and a number of other things that are very handy to have in an emergency. The instructions are very detailed and the project is easy to build. A good way to get started with solar. Thanks very much to John for providing this material! Link to PDF is not found. Thanks -- should be OK now.